I couldn't belive that this would even happen like this. I thought I had a good working system let my tribe tell it. As I sat down in front of a pile of books and papers that awkardly lined the floor of my home office, when I got a hunch that things were about to shift and that the next few weeks would be a HUGE tansition. Not really paying attention to flow of what this meant, I pushed along as usual. Later that week, it hit me... I know why so many families struggle with the idea of homeschooling- they are just stuck in the way of traditional education. So I laid in bed that night, I could not fall right to sleep, so I grabbed my cell phone (my husband calls it my boyfriend) and began randomly searching for titiles of school types (i.e., homeschool, unschool, worldschool) you see where I'm going here. And what I found was a bunch of restricted ideas about how to be a good teacher for your child. I was sort of discussed. The long lists of things to do. The hardwork vs. The non-academic stuff. Not only was it overwhelming, I was beginning to question my own message to homeschoolers. I thought about how capable my own seeds are of being inventive and how well they are developing. Then I began writing a laundry list of things that I would do different to make sure that we not only sustain as a homeschooling family, yet thrive as a family of FREESchoolers. This is the only way that we could REALLY be of any help to others. While it was my first thought to give you all 47 things I jotted down, I had to digress. So, here I will share with you what (FREESchooling) means for you as members and our future members in 3 points. 1.) Managed expectations are the key to success for any parent with school-age children. We cannot let our own expectations of our child's future affect the way we navigate the educaitonal system. Letting change seek you out in what some call a crisis, I call it the ancestors speaking to us to evolve. 2.) Guard your heart and mind "At The Same Damn Time". Yep, I said it. In a world full of influence and social normalcies, we have to be focued yet flexible. Bad attitudes, arguments, and moodiness according to the RETROGRADE periods are trivial. This is a powerful tool to me and I find solace in baring witness to all the good things that I see my children doing and learning how to do something new... EVERYDAY! Greetings SOIL Family and Friends! RaShaunda Lugrand here! I AM LOVING the new found inspiration to support various families in their homeschool journey as the first two quarters have passed. I've grown so much as I go back through our material again. So, I really want to make sure that I am present and availible to offer my expertise and creative knowledge in the process of helping other families find their homeschooling sweet spot. I want you to know that I am not here to sell you any textbooks, worksheets, or curriculum. What I am here to do is, offer you the opportunity to expand your scope as parent and facilitator, of a highly intuitive and observant home educator. Below I share three of our core tips to make your homeschool journey one that is fun and creative by shaping you attitiude regarding what a GOOD education is. Before I can give you the tools to a more fruitful homeschool experience, I have to help you get clear on you attitudes surrounding YOUR individual homeschool model. Completing this task alone, will help you to better understand how to proceed and whether homeschooling is right for you and your family structure. One of the biggest reasons people fail at homeschooling is because they are too busy competing with standardized goals to facilitate for their seeds homeschool expereince. I am not saying that you should not strive for excellence, but it takes time to really identify with what your seed needs to learn according to their own composition and NOT that of traditional standards. If it causes you stress, it is because you are not moving with the flow of learning, yet trying to control the process. Taking time to plan out your day, managing your expectations, and completing simple tasks is what sets the intention in motion. If what you are planning isn't convenient to your lifestly, then obsticals will present themselves and you will meet conflict head on. And often times this will get in the way of the real life things that need to be attended to. In closing, I want to offer you a quick BONUS Trick that I keep in my tool box to make sure that I maintain a peaceful and productive day. Through supporting the natural rhythm of my life, I can get the maximum benefit from my holistic homeschool experience. Are you a homeschooling family? Well this event is for you! This is a FREE event. Donations of $5 or more are welcome to further the promotion of our early literacy campaign “A Book On Every Bed”. Thank you for becoming a member of our homeschool family. We are excited to have you as a part of our experiential learning platform. We know that you are anxious to see what your membership entails, we are drawing near to finalizing our launch date and looking forward to your feed back. 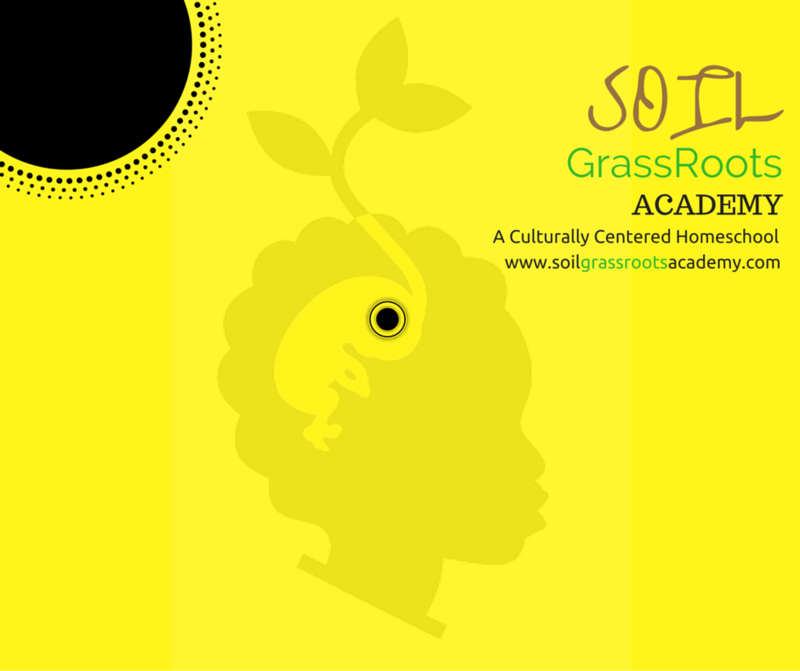 Here you will find a detailed foundation of what your membership means to SOIL GrassRoots Academy. The beauty of building something new is never the easiest task. It takes plenty of patience and flexibility to bring the vision to pass. Only beginning as a concept, SOIL blossoming into a full fledge homeschool concierge service. While there is such a need for alternative education, we aim to facilitate a strong cultural perspective, that magnifies the power of language and communication. We believe that language acquisition does not begin with speech, yet with vibrational frequency. "A large portion of the Egyptian philosophy and religion was constructed almost wholly upon the science of numbers, everything in nature was explained on this principle alone". Athanasius Kircher (1602-1680): German Jesuit Mathematician & Philosopher. This holds true for the inner core of our teaching concepts at SOIL. From the innate spark of universal intelligences we find, a mathematical language of vibration, which articulated by numbers, and expressed through geometric ratios that define sound, color (light,) and form. Everything in creation is designed and defined by these archetypal patterns. It is the geometric expression of these archetype energies that opens our intuitive awareness and understanding of these energetic characteristics. Numbers and the symbols that express them, have the same meaning throughout this world's cultures, and indeed, it is this language that is truly universal. The SOIL Blueprint is designed from the root-essence of geometric principles and characteristics, from number 1 - 9. This is the original pattern or model from which all things of the same kind are copied or based. SOIL is a unique prototype for highly developed elements of psychological behaviors from observing the modern theory of origins, collective unconsciousness, and biological curiosity. A perfect example would be; the child that is born with no idea that he or she is identified by a specific race, but an inherited idea is derived from certain experiences, which make the child aware of his or her being on an individual aspect unconsciously. So in the mind of a child, they gravitate to what is common for them, what they want to experience, what is innately familiar. This action is common, with speech development because similar things are patterned by specific building blocks that define the original model or example. Defining The Usage Of SOIL will take more than an email or blog post to understand. It will take conceiving the vision and then giving birth to a new thing. Like a woman transitioning from the first trimester to full term being 36 to 40 weeks, our thematic approach, brings early childhood education back to the womb of the community. Our 3 day classroom week, extends 2 days of self discovery into the social field, for emotional and intellectual immunity. Children are able to experience life outside of homeschool work, while exploring the valor of everyday patterns in their lives as it relates to influence, discipline, and acceptance of the world that they understand and know. Like the first stone that is made, from the elements of soil and water, there has to be a right consistency in order for the stones to be molded in a way, that promises a sturdy foundation on which to provide balance. This is part of the mathematical principle we call “Math Magic” for the toddlers and “ALPHA Math” for the older seeds. Math is our first building block of self expression and the firmness of our strength of mind and spirit. Without knowledge of right mathematics our people parish for mathematics is the first scientific language.